The prototype manganese-hydrogen battery, reported today in Nature Energy, stands just three inches tall and generates a mere 20 milliwatt hours of electricity, which is on par with the energy levels of LED flashlights one might hang a key ring. Despite the prototype's diminutive output, the researchers are confident they can take this table-top technology up to an industrial-grade system that could charge and recharge up to 10,000 times, creating a grid-scale battery with a useful lifespan well in excess of a decade. Yi Cui, a professor of materials science at Stanford and senior author on the paper, said manganese-hydrogen battery technology could be one of the missing pieces in the nation's energy puzzle – a way to store unpredictable wind or solar energy so as to lessen the need to burn reliable but carbon-emitting fossil fuels when the renewable sources aren't available. "What we've done is thrown a special salt into water, dropped in an electrode, and created a reversible chemical reaction that stores electrons in the form of hydrogen gas," Cui said. The team that dreamed up the concept and built the prototype was led by Wei Chen, a postdoctoral scholar in Cui's lab. In essence the researchers coaxed a reversible electron-exchange between water and manganese sulfate, a cheap, abundant industrial salt used to make dry cell batteries, fertilizers, paper and other products. To mimic how a wind or solar source might feed power into the battery, the researchers attached a power source to the prototype. The electrons flowing in reacted with the manganese sulfate dissolved in the water to leave particles of manganese dioxide clinging to the electrodes. Excess electrons bubbled off as hydrogen gas thus storing that energy for future use. Engineers know how to recreate electricity from the energy stored in hydrogen gas so the important next step was to prove was that the water-based battery can be recharged. Cui estimated that, given the water-based battery's expected lifespan, it would cost a penny to store enough electricity to power a 100 watt lightbulb for twelve hours. "We believe this prototype technology will be able to meet Department of Energy (DOE) goals for utility-scale electrical storage practical," Cui said. The DOE has recommended batteries for grid-scale storage should store and then discharge at least 20 kilowatts of power over a period of an hour, be capable of at least 5,000 recharges, and have a useful lifespan of 10 years or more. To make it practical such a battery system should cost $2,000 or less, or $100 per kilowatt hour. Former Department of Energy Secretary and Nobel laureate Steven Chu, now a professor at Stanford, has a long-standing interest in encouraging technologies to help the nation transition to renewable energy. 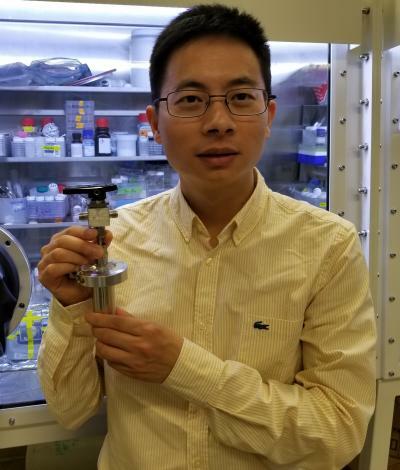 "While the precise materials and design still need development, this prototype demonstrates the type of science and engineering that suggest new ways to achieve low-cost, long-lasting utility-scale batteries," said Chu, who was not a member of research team. According to DOE estimates, about 70 percent of U.S. electricity is generated by coal or natural gas plants, which account for 40 percent of carbon dioxide emissions. Shifting to wind and solar generation is one way to reduce those emissions but it creates new challenge involving the variability of power supply. Most obviously, the sun only shines by day and, sometimes, the wind doesn't blow. But another less-well understood but import form of variability come from surges of demand on the grid – that network of high-tension wires that distribute electricity over regions and ultimately to homes. On a hot day, when people come home from work and crank up the air conditioning, utilities must have load-balancing strategies to meet peak demand: some way to boost power generation within minutes to avoid brownouts or blackouts that might otherwise bring down the grid. Today utilities often accomplish this by firing up on-demand or "dispatchable" power plants that may lay idle much of the day, but can come online within minutes – producing quick energy but boosting carbon emissions. Some utilities have developed short-term load balancing that does not rely on fossil-fuel burning plants. The most common and cost effect such strategy is pumped hydroelectric storage: using excess power to send water uphill, then letting it flow back down to generate energy during peak demand. However, hydroelectric storage only works in regions with the water and the space, so to make wind and solar more useful DOE has encouraged high capacity batteries as an alternative. Cui said there are several types of rechargeable battery technologies on the market, but it isn't clear which approaches will meet DOE requirements and prove their practicality to the utilities, regulators and other stakeholders who maintain the nation's electrical grid. For instance, Cui said rechargeable lithium ion batteries, which store the small amounts of energy needed to run phones and laptops, are based on rare materials and are thus too pricey to store power for a neighborhood or city. Cui said grid-scale storage requires a low-cost, high-capacity, rechargeable battery and the manganese-hydrogen process seems promising. "Other rechargeable battery technologies are easily more than 5 times of that cost over the life time," Cui added. Chen said novel chemistry, low cost materials and relative simplicity made the manganese-hydrogen battery ideal for low-cost grid-scale deployment. "The breakthrough we report in Nature Energy has the potential to meet DOE's grid-scale criteria," Chen said. The prototype needs development work to prove itself. For one thing it uses platinum as a catalyst to spur the crucial chemical reactions at the electrode that make the recharge process efficient, and the cost of that component would be prohibitive for large-scale deployment. But Chen said the team is already working on cheaper ways to coax the manganese sulfate and water to perform the reversible electron exchange. "We have identified catalysts that could bring us below the $100 per kilowatt hour DOE target," he said. The researchers reported doing 10,000 recharges of the prototypes, which is twice the DOE requirements, but say it will be necessary to test the manganese-hydrogen battery under actual electric grid storage conditions in order to truly assess its lifetime performance and cost. Cui said he has sought to patent process through the Stanford Office of Technology Licensing, and plans to form a company to commercialize the system. Yi Cui is also a professor in the Photon Science Directorate at SLAC National Accelerator Laboratory, and a Senior Fellow of the Precourt Institute for Energy, a member of Stanford Bio-X and the Stanford Neurosciences Institute. Additional coauthors include Guodong Li, a visiting scholar in materials science and engineering and now with the Chinese Academy of Sciences; postdoctoral scholars Hongxia Wang, Jiayu Wan, Lei Liao, Guangxu Chen and Jiangyan Wang; visiting scholar Hao Zhang; and graduate students Zheng Liang, Yuzhang Li and Allen Pei.